To celebrate Easter and the beginning of spring (Thank GOD), what’s better than a slew of scary-@$$ bunnies? And if you have ever been to a mall with your kids for pictures with the Easter Bunny, you know how scary they can get. Is it a rabbit? Is it a dog? A rat? Who cares, it’s scary and it wants all your EGGS! I guess we have reached a point where naked Easter bunnies are too risqué. There comes a time where underoos are necessary. *&%$, these boots are killin’ me. Kids, if you eat too many carrots, this is what happens. You’ll eventually morph into a bunny. With no hands. Oh, the birds! The BIRDS! Get ’em off! The horror! THE HORROR! I guess I see the need for those underoos now. Shake it, shake that booty! Have the give Easter Bunny Corp. credit for their technological advances. Robo-bunny clones get the work done without all the complaining about benefits and promotions. Cow bunnies? What, do they try to turn kids off of MILK chocolate? Eat more PEEPS!? (no, this wasn’t on Clipart.com. 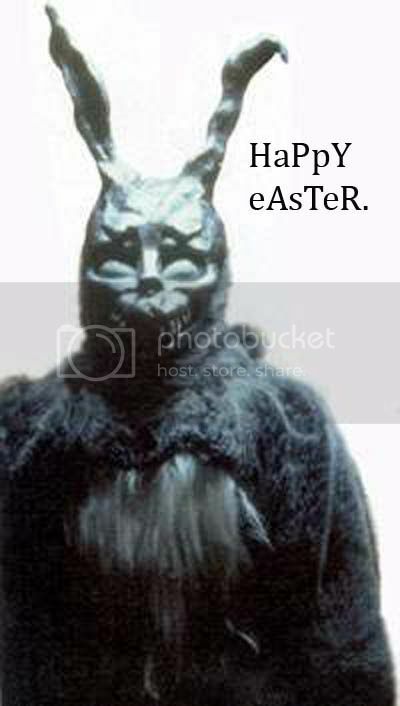 It’s “Frank” from the movie “Donny Darko” Scariest. Rabbit. Ever. If you can have dust bunnies…why not cow bunnies. That baby with the rabbit ears bonnet looks like a grown man disguised as a baby.